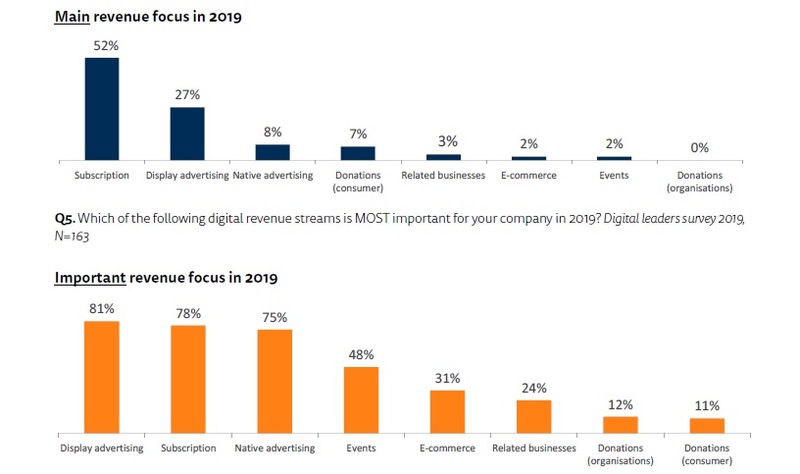 The report, based on 200 editors, CEOs, and digital leaders from 29 countries, states that more than half (52%) of digital leaders expect subscriptions to be a main revenue focus this year. This compares to just over a quarter (27%) who cite display advertising as a main revenue source, 8% that state native advertising and 7% that report donations. Still, advertising is an important focus. A strong majority see display advertising (81%), subscriptions (78%) and native advertising (75%) as “important or very important” for company revenue. Social media presents options for marketing and acquisitions. Publishers that are focusin on subscriptions use social media more as a marketing and acquisition channel. Still, social media usage and results differ by publisher. Magazine brands are more likely to use Instagram and Snapchat for marketing, while local news publishers use board reach platforms for referrals. Publishes use visual storytelling to attract a younger audience. Stories has become a highly popular storytelling format. It is used daily by 150 million people on Facebook, 190 million on Snapchat, and 300 million on Instagram. Publishers are utilizing visual storytelling because it works well on mobile and helps attract a younger audience. Nielsen believes that in order to ensure journalism is valued, publishers must identify the needs of the reader. Importantly, there are new strategies and technologies available to build consumer value, heighten product attraction and increase engage with paying consumers.